How many eggs does it take to make enough pancakes to feed over 6,000 people? This Diva and my family discovered the answer on my journey to the 48th Belmore Maple Syrup Festival this past Saturday. Even with all the pancakes, syrup and sausages, a youngster chooses a creamer as the favourite treat. over the years. Visitors come from all over Ontario to enjoy the sweet taste of local products brought together to make a delicious meal. Over 200 eggs and 700 litres of milk are used to mix into batter about 600 kg of flour, 80 kg of sugar, and more dry goods. The dry ingredients are mixed ahead of time so all the volunteers need to do on the Festival days is add the wet ingredients and then the batter is ready for the line cooks. The pancakes are topped off with more than 150 gallons of locally produced maple syrup. 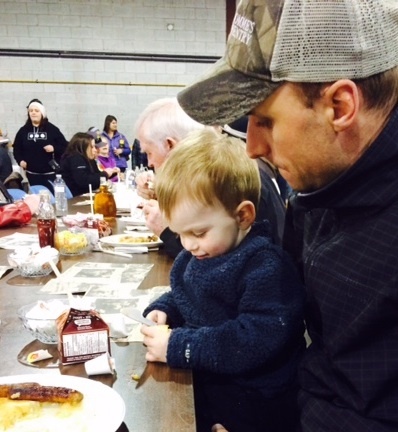 Served alongside the pancakes are over 4,000 pounds of local pork sausage, which my kids could not get enough of. This festival is truly a local food celebration! It is definitely worth the wait (we were lucky to only wait 30 minutes) to watch the line in action as hot, fluffy pancakes on a conveyor belt are placed on plates in an innovative process that makes service the fastest it can be. 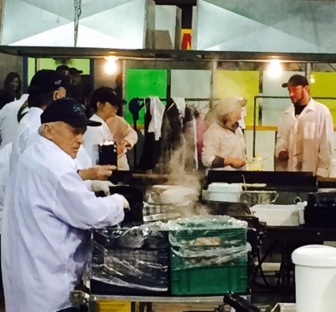 It takes an army of volunteers to prepare the meal. And there is no shortage of food. If you find that the two or three pancakes along with as much sausage your plate can hold are not enough, servers are waiting to deliver more hot yummy goodness directly to your plate. The Festival takes place in the Belmore Community Centre, which becomes packed with all the visitors in attendance enjoying the delicious food, the local entertainment, fresh baking, and more. My kids really enjoyed the kid’s activity room, which included face painting, a clown offering balloon animals, a variety of crafts, and a space to themselves. A whole section of the community centre is packed with local vendors selling a variety of items including jewellery, woodworking, sewing, and pottery. The kids were enthralled by the mysteries of turning balloons in animal shapes. One of the most popular destinations is the demonstration that happens out back of the community centre of how maple syrup is made. My kids loved the smell of the sap bubbling away to become rich syrup. Overall, I could not think of a better way to celebrate the arrival of Spring than enjoying the Maple Syrup Festival and the very friendly community of Belmore. This Diva will be back for the 49th year! For more information on festivals and events in Huron County, visit Ontario’s West Coast website. 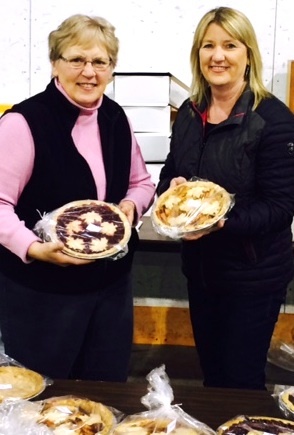 Homemade pies were a hit with visitors. 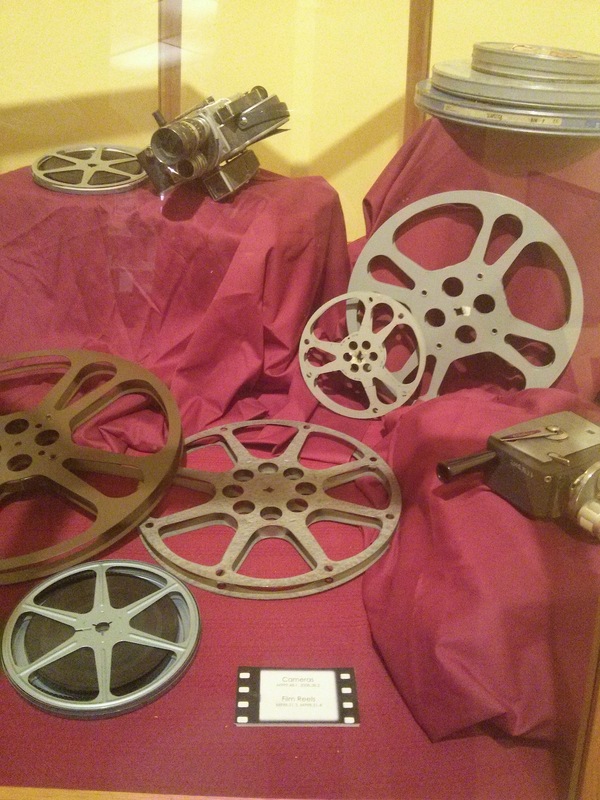 HURON COUNTY – The Huron County Museum just launched a new temporary exhibit called Movie Connections. 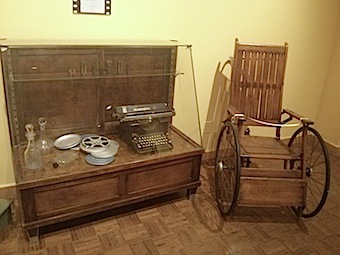 Artifacts from the collection and archives have been selected based on themes of popular classic movies. Some were easy guesses (an awesome classic jukebox and cheerleading uniform), while others were less obvious (an old-fashioned wheelchair comes to mind). 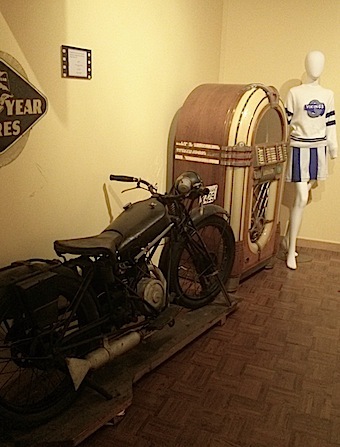 The exhibit has been beautifully decorated, with objects in big, old wooden cases, and film reels on the walls. Movie Connections seems like a great way to feature different objects and tell interesting local stories. 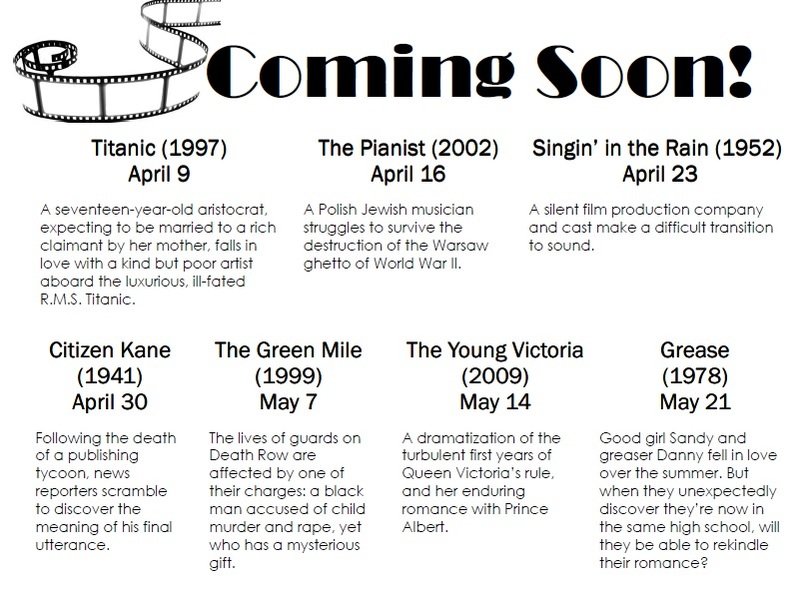 You may make the guessing game a little easier for yourself by taking a look at the list of featured films. I’m told many of the films were selected from top 100 lists, and the collection is aimed to represent different decades in film-making. There is a great variety, from serious to upbeat (Grease sing-along anyone??). Films are included with the price of admission, and free for members of the Huron County Museum or any of its partner sites (Grey Roots, Bruce County Museum and Cultural Centre, Waterloo Region Museum and Simcoe County Museum.) Popcorn will be served, and you can also bring in your own snacks. The exhibit runs from April 7 through May 23. Films will be shown in the Huron County Museum Theatre each Thursday evening, starting at 7 p.m., with an extra showing of The Young Victoria on Victoria Day Weekend. Admission: Adults. $7.50; Seniors aged 65+, $6.50; Students aged 11+ & in school, $5.50; Children aged 6 to 11, $4; Family living in same residence, $25; Pre-schoolers up to age 5, free, and; Members, free. HST extra. Time: 10:30 a.m. – 11:15 a.m. Details: Hop along to the Blyth Library for an Easter Egg Hunt and Craft. Registration is required for the program and is geared for children ages 3 to 6. Details: Please register in advance at the South Huron Library or the ABCA Office. Deadline to register is Thursday April 2 at 5 pm. 12 years and under; only 250 spots. Time: 11 a.m. – 12 p.m. 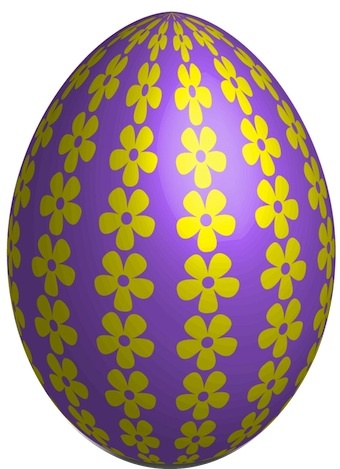 Details: Easter Egg Hunt, Easter Bunny & pictures, $2 pancake breakfast, crafts, games, baby chicks & bunnies plus more! 12 and under for the actual Easter Egg Hunt. 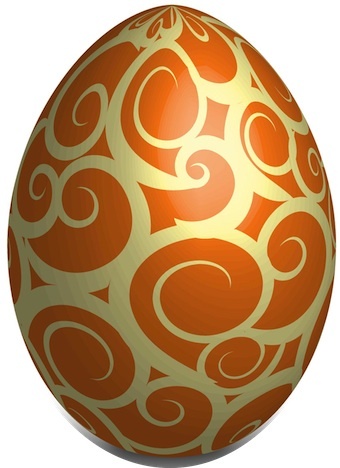 Details: 12 and under, Easter Egg Hunt, colouring contest, a visit from the Easter Bunny, plus a BBQ and refreshments. Bring your smiles and Easter baskets! Time: 10 a.m. – 11 a.m.
Time: 10 a.m. – 1 p.m. Details: Easter egg hunt (12 and under, two age groups), Easter Bunny, basket decorating, games, crafts and facepainting! 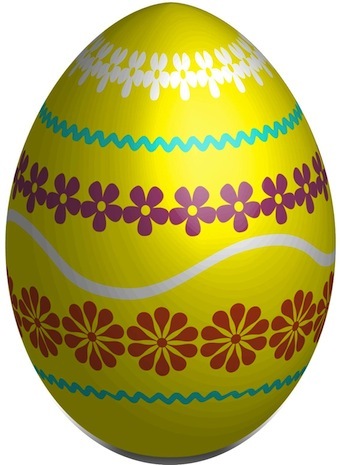 Details: Easter Egg Hunt (two age groups), raffle for an Easter Egg basket plus more! Time: 10 a.m. – 11:30 a.m. 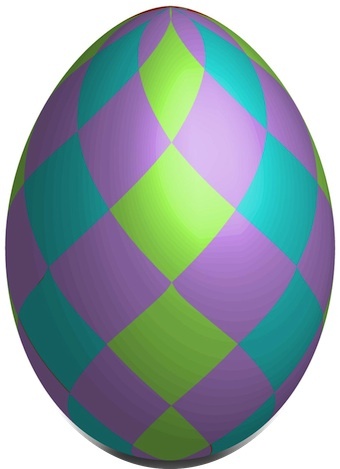 Details: Easter Egg Hunt at 11 a.m., fun stations set up for kids starting at 10 a.m. Colouring contest awarding 1st, 2nd and 3rd prizes. Colouring pages can be picked up at the Auburn Post Office. 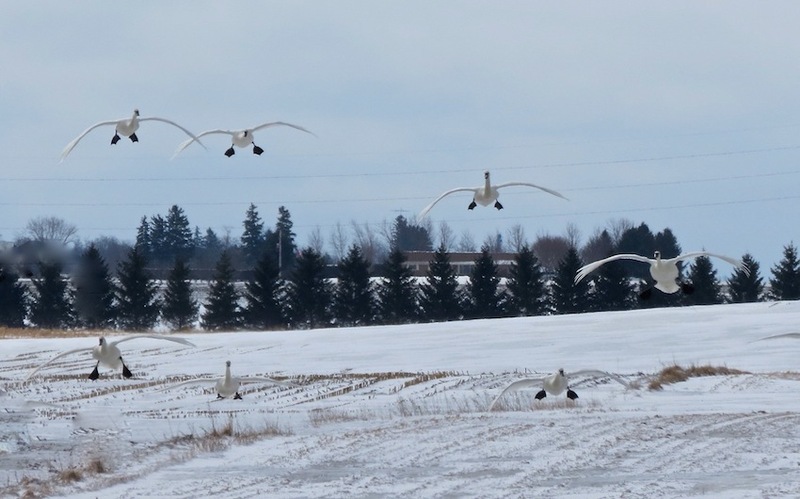 These tundra swans let down their landing gear over a farmer’s field near Seaforth today. Photos courtesy of Exeter photographer Bonnie Sitter. 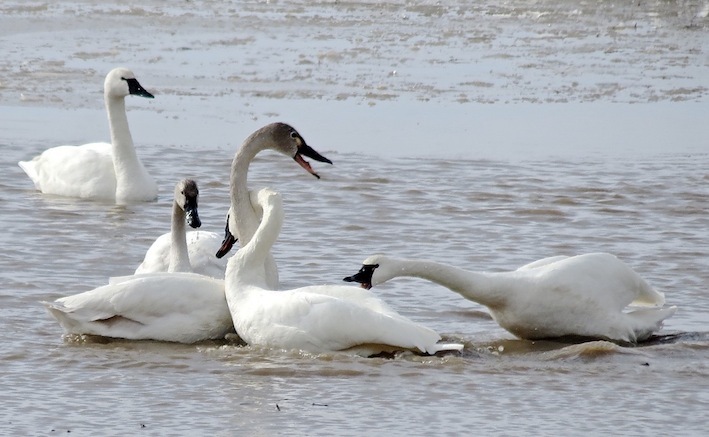 SEAFORTH – It’s spring, and while most of us are looking forward to warmer days, the majestic white tundra swans are making their way back from Chesapeake Bay, Maryland to the Arctic Circle for summer vacation. Along their arduous route, they can be spotted at annual staging areas in farmers’ fields and open waters, which provide them with food and rest. For a full description of their migration, visit The Friends of the Pinery Park’s website. Looking for entertainment that is good for both kids and adults alike? 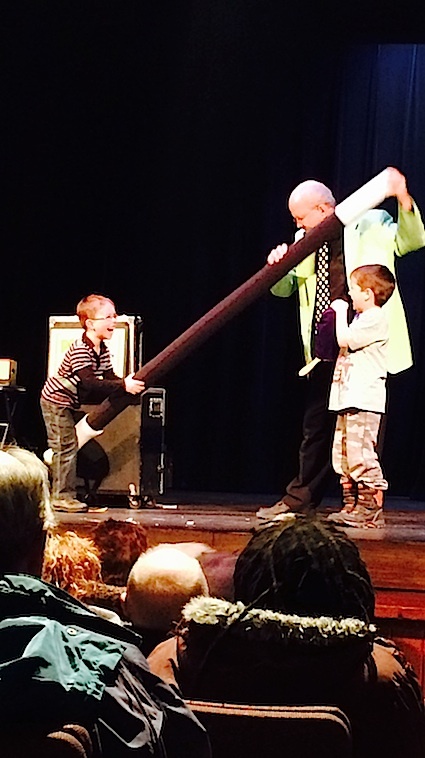 Abra-KID-abra pulls an excellent magic show out of a hat that left both my daughter and me in stiches. As soon as we entered the Blyth Memorial Community Hall the comical mood was set with the music playing as we waited for the show to start. 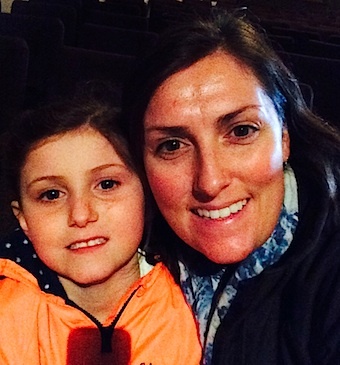 The theatre was full of kids of all ages, parents and grandparents who were all eager for the show to start. 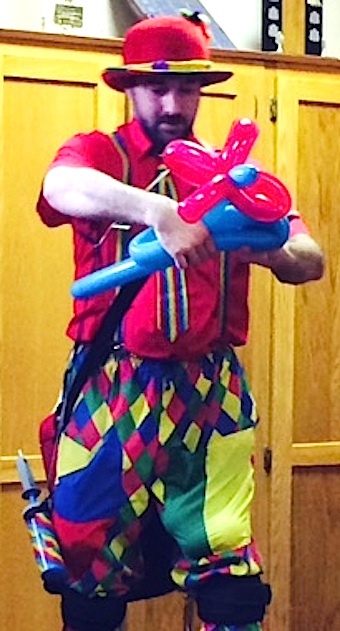 Once Peter Mennie took the stage you knew that it would be a performance that would leave adults and kids in awe of his magic and in stitches from all the comedy that he effortlessly dishes out. Diva Caroline Thuss and her daughter were in stitches during the show. His magic and illusions allowed a multitude of kids to become part of the show as his “assistants” and he played off of their reactions, which if you have kids you know they can say some pretty funny things. Many of the kids around us wanted to get on stage and he made sure he involved as many as he could. My daughter often whispered to me “Mom, he is soooo funny!” and “WOW…how did he do that?” I have to admit that I also wondered the same thing. After the show, they had kid-friendly magic wands for sale at a very reasonable price of $3, which included a booklet of magic tricks to do at home. I bought five of them to give to my other children and my nephew and niece the next time I see them. After the show, we headed across the street to the Queen’s Bakery to enjoy a coffee. They were having a pirate-themed week, which added to more fun. My daughter enjoyed a treasure chest (Rice Krispies squares with chocolate gold coins) and a Davey Jones root beer while I enjoyed a wonderful blueberry scone and a latté. What a great way to end a fun afternoon outing in Blyth! To find out more about attractions in Huron County, visit online. Blyth Memorial Community Hall is a 444-seat theatre owned by the Municipality of North Huron. It is home to the Blyth Centre for the Arts, which includes the Blyth Festival, a professional summer theatre that produces new Canadian plays. Check its 2015 season here. 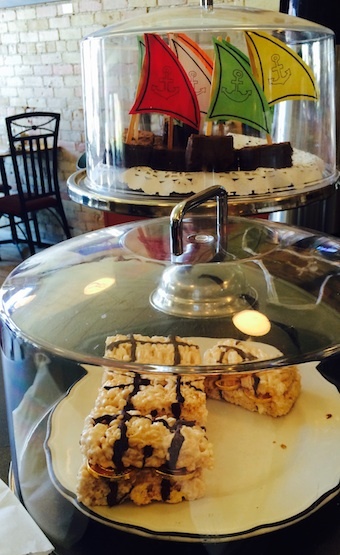 Queen’s Bakery is a coffee shop and bakery located in a former apothecary on the main street of Blyth. Lunch served. This stunning canopy of trees can be found on the Mara Street Walkway, which is part of the Heritage Trail in Bayfield. Photo courtesy of Heidi & Tyler Hessel, Outside Projects. 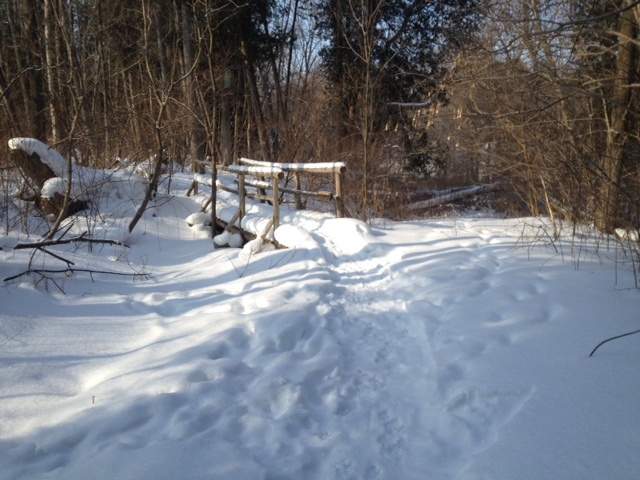 HURON COUNTY – Now that the days are getting longer and a warm breeze has blown into Huron County, the conditions are perfect to get out to cross-country ski, snowshoe or hike the many trail systems across our woodlands, riverbanks and countryside. Here are a couple of top picks to get you started. Explore more of the county’s natural areas and trails here. 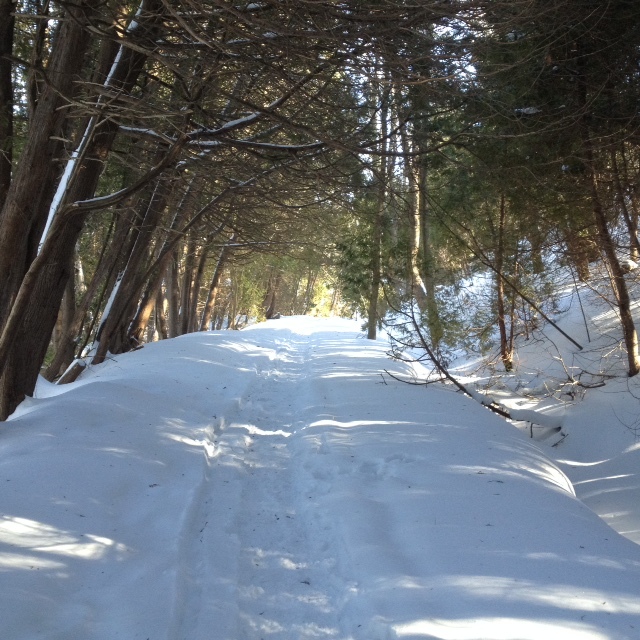 We often enjoy snowshoeing the many trails in and around Bayfield. All are easily accessible and within a light to moderate difficulty level. 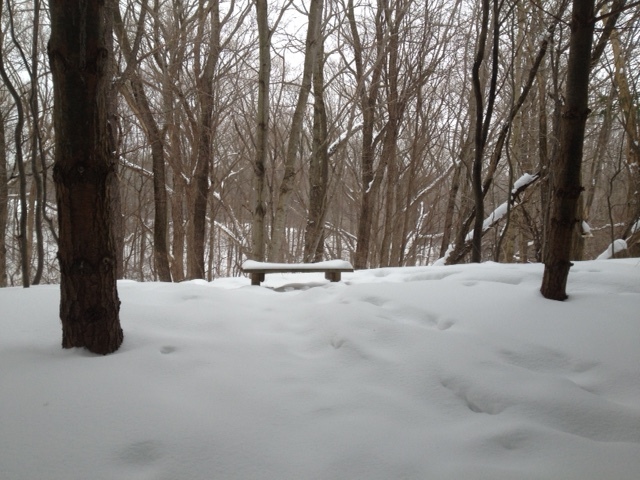 They’re easy for anyone to get out and enjoy the winter even if you are simply hiking or have on a pair of snowshoes. Maps and information about these trails can be found on the Bayfield River Valley Trail Association website. The Mavis / Taylor Trail, Varna. Elementary School. 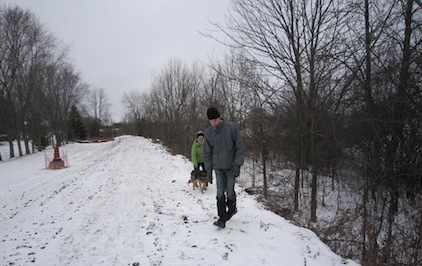 Behind the school is a farmfield that is proposed for the Wingham Creek Subdivision. 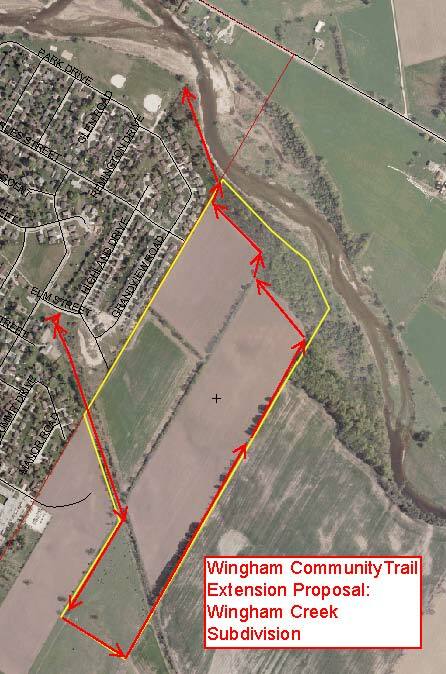 There is an easement around the field for an extension to the Wingham Community Trail. A lot of people cross country ski on this property. It connects with the parkland owned by North Huron that extends along the Maitland River. Tim Craig and Julie-Anne Lizewski play to a toe-tapping crowd at Queen’s Bakery in Blyth. BLYTH – Leather soles of many boots slap the wooden floorboards in unison in this village coffee shop on a Saturday night, Feb. 28. 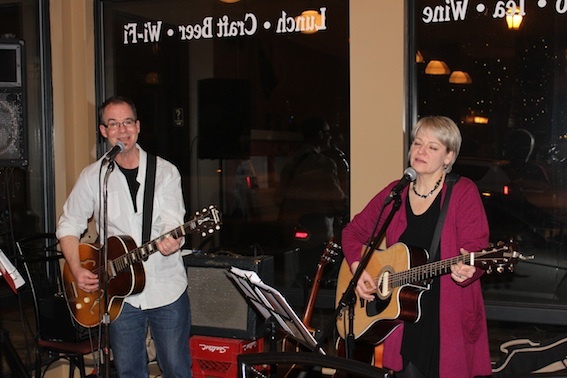 The rhythmic, dull thuds accompany harmonica, acoustic guitar and harmonized vocals from local musicians Julie-Anne Lizewski and Tim Craig. It’s the second appearance at Queen’s Bakery in Blyth for these two, who are relatively new to the local music scene, and tonight there’s a good crowd of about 20 who’ve settled in for an evening of music, coffee, drinks and desserts. The atmosphere is cozy in this bakery, with its exposed brick, high tin ceilings, full-length front windows with a view of white Christmas lights on trees and a set of blinking blue string lights in the Blyth Festival’s courtyard across the street. Finola McGuinty and Mike Crocker throw some Dixie Chicks into their set. We ease in with Canadian band Tragically Hip’s Bobcaygeon, then move through some gems I’ve never heard before, like Kathleen Edwards’ Alicia Ross, a song written from the perspective of a 25-year-old Markham woman who was killed by her next door neighbour, and Shawn Colvin’s Polaroids, an upbeat number with all sorts of vocal twists and turns. Then there’s the angry, cathartic song with a title I can’t print here because it’s chock full of potty mouth language. Along the way, the duo perform Bob Dylan’s Shelter From the Storm, a song request from a woman in the audience. Like most of the playbill for the evening, the lyrics are rich and poetic. The tempo flirts with upbeat – toes are tapping – but remains somehow constrained. Owners Les Cook and Anne Elliott waltz in the kitchen. There are other familiar songs, and yet they’re just a little bit different. I discover there’s far more to the 20th century American standard Irene than the abbreviated version sung at the end of many nights at a pub. 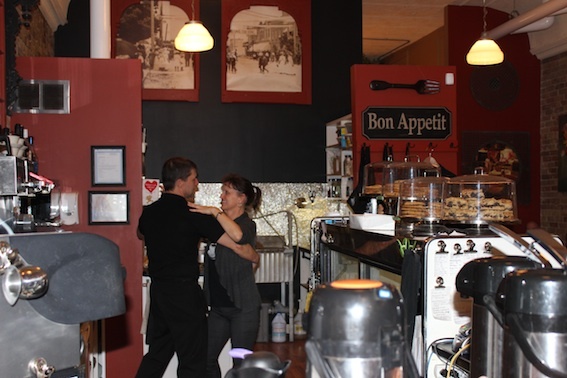 As Tim plays the lap steel guitar, owners Anne Elliott and Les Cook take up a waltz behind the counter, then gracefully twirl through the restaurant. The couple enjoys hosting local musicians from time to time. 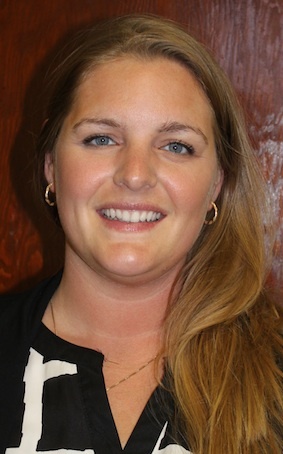 “It’s something we wanted to do from the get-go. 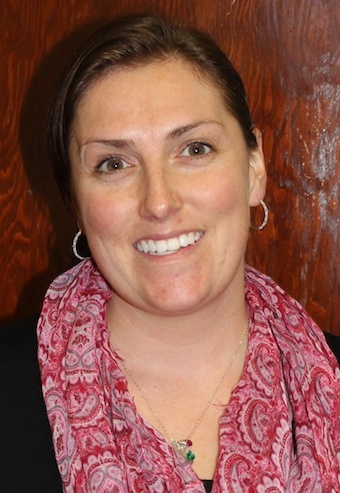 Because we dance we kind of have a thing for live music,” said Les, who is a dance instructor at Blyth East Side Dance. 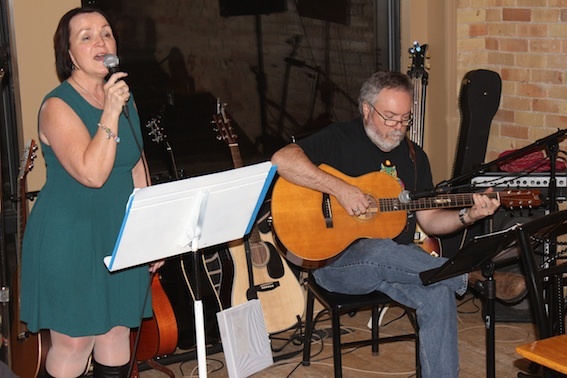 Each of the two sets are opened by well-known Goderich musicians Finola McGuinty and Mike Crocker, a great pairing for Julie-Anne and Tim. 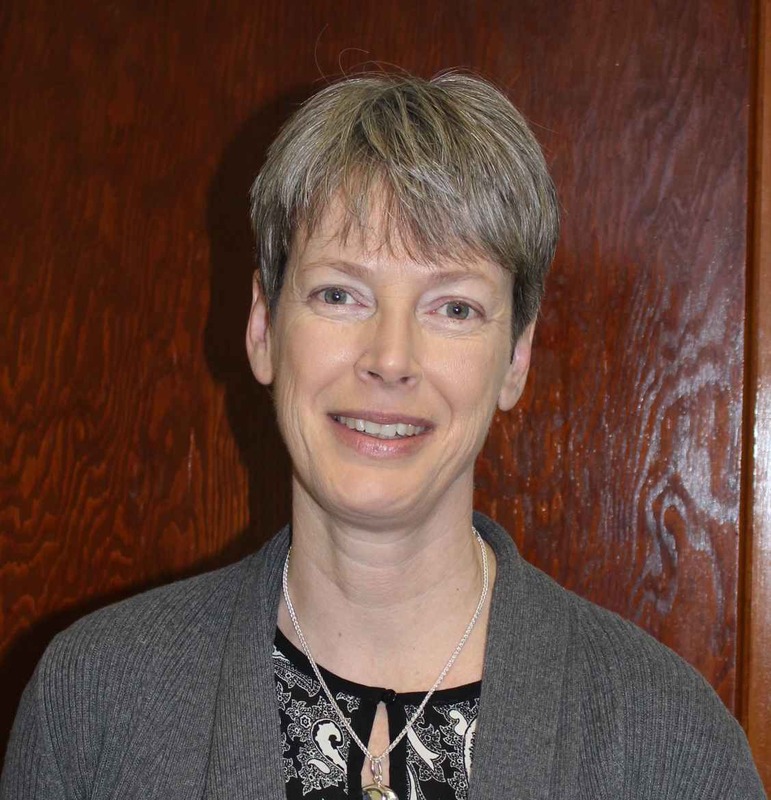 Perhaps their most endearing piece is Nancy Griffith’s Trouble in the Fields, a song Finola first heard in Belfast but says can easily apply to the farming community that is Huron County. In fact, most hands shoot into the air when she asks who in the audience has a connection to farming. It’s to those farmers she dedicates the song. Huron County pubs and restaurants are great supporters of live music. Friday, March 6, North Country Towers will play at Cinnamon Jim’s in Brussels. Check Ontario’s West Coast events calendar for more information on this and other events.